A little out of period, this picture was painted probably 10 or 20 years prior to the 1640 by an unknown artist, but the clothes worn by the group of morris dancers and the watchers show the kind of common garments that are only seen for the period in continental paintings. There is very little of this kind of thing from England. The picture is © The Fitzwilliam Museum, Cambridge and you can find more about it by following this link. 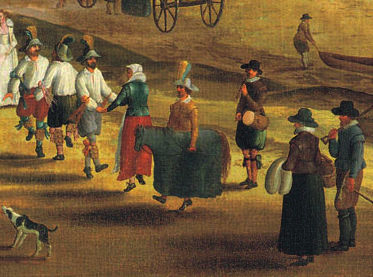 In this detail you can see the dancers are wearing breeches and shirts only, but still keeping their hats on. Must have been a nice hot day! The woman dancer has an early rebato type collar with a linen coif on her head. Notice her petticoat is short enough to allow her to dance. 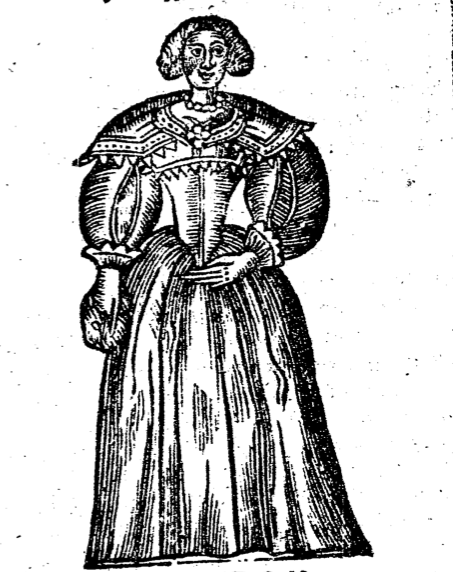 The clothes are old fashioned, particularly the breeches, but not completely out of period for 1640s. 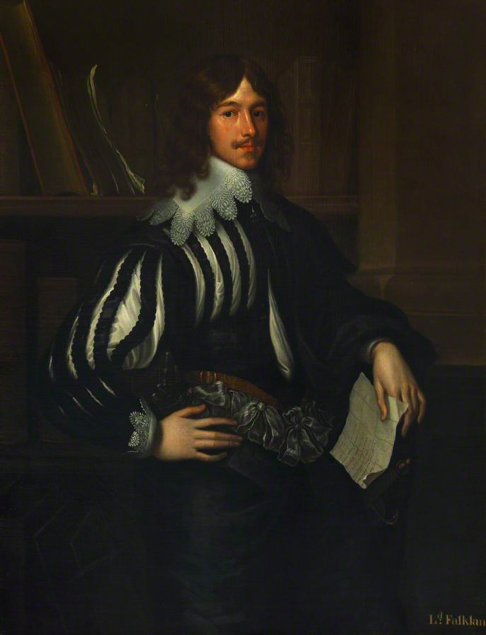 Sir Thomas Fairfax, and the Officers of His Armie sitting in Councell. 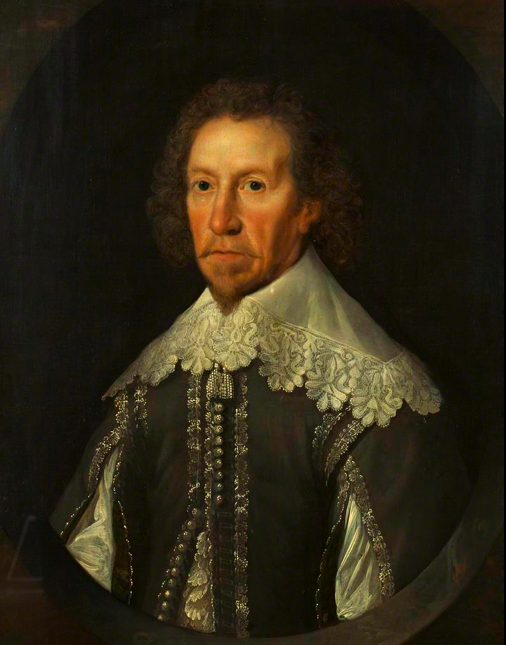 Also from September 1647 and following on, this is Fairfax’s side of the story and is a collection of his letters sent to various parliamentarians following the Putney Debates. 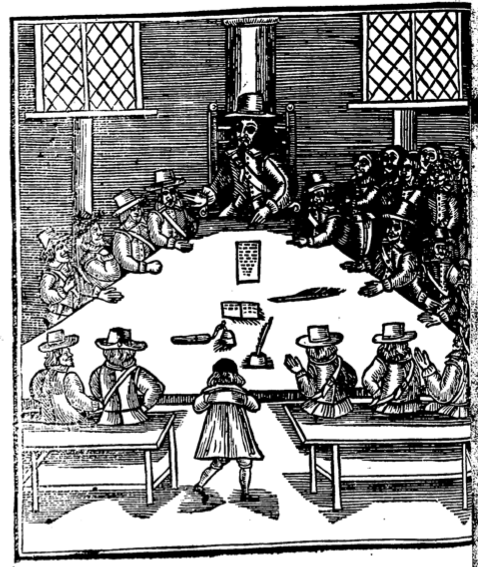 Frontispiece is this image of Sir Tom and his council. Ignoring the fact that the artist has made the general look twice as big as his officers, this is a fly on the wall picture of the army council in session. They are mostly (apart from the guy in academic gown in the foreground) dressed in tabbed doublet, plain band and tall hats. No scarves in evidence but to a man they have thin cross sword belts/baldricks. I wonder what the bell on the table was used for? At a great Meeting of the Generall Officers of the Army at the Head-quarters at Putney in behalf of the whole Kindome of England. 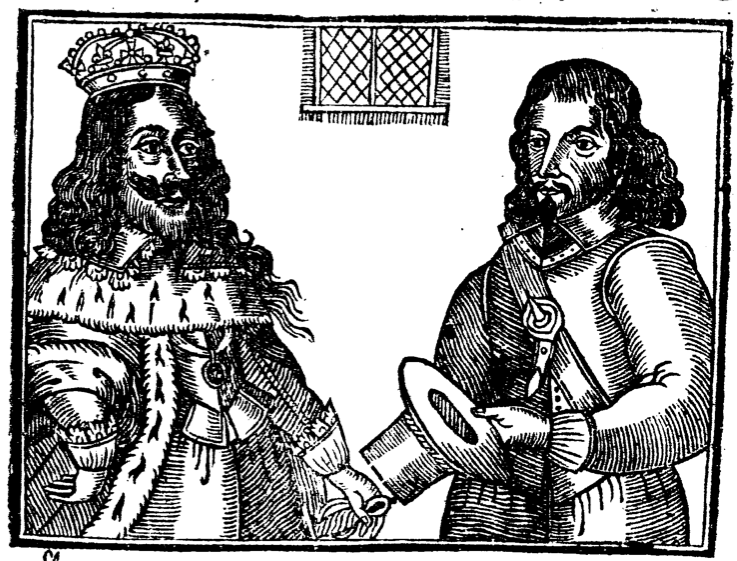 Account from the Army perspective of what became known as the Putney Debates September 1647. This rather nice picture is on the front page of the document. This guy, presumably one of the agitating officers at Putney wears a smart doublet with a falling band decorated with a thin edge of lace. 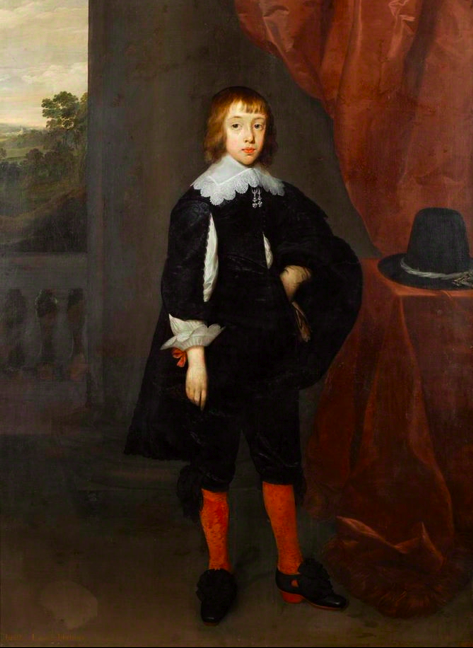 Born into a royalist family, Christopher, who was to become the 1st Viscount Hatton was painted here aged nine in 1641 by Cornelius Janssens van Ceulen. He is every inch the young gentleman with his smart black suit of figured silk, short cloak, red silk hose, shoes with high red heels and rosettes and a laced falling band. He also has a tall crowned hat with a rather natty twisted hat band which he’s placed on the side table. To the honourable Members of Both Houses. Or The humble PETITION of many Thousands of the well-affected, within and without the lines of Communication, Virgins, Maids, and other young Women not married, etc. And in the behalf of the whole Kingdome, for their law-ful dayes of recreation. With their Declaration to hold out stiffly and to comply with the Apprentices or others for their tollerable Tolleration. Anyway, the picture on the front shows a good image of a maid in contemporary clothes. She thinks she’s upper class as she’s dressed her hair nicely and hasn’t covered it up. And Declaration to His Excellency Sir Thomas Fairfax. Printed in London 1647. The King was still hopeful that he could reach a negotiated settlement even though he’d all but lost his forces and the war by this point. 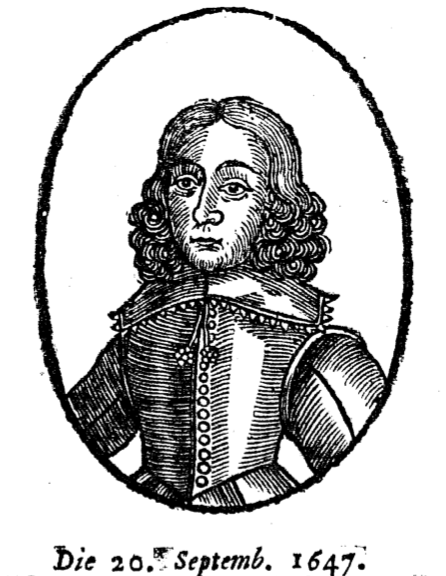 He’s wearing a short tabbed doublet under his robes. Tom Fairfax is showing due deference by doffing his hat, which has a neat twisted hat cord, and he wears a short doublet and baldrick belt for his sword, though that isn’t shown. The King still has his sword even though he was in captivity. Fairfax is also wearing a gorget plate under his small shirt band to indicate he’s a military man in case we didn’t know. …are Preachers in and about The City of London. A single page publication from 1647 that complains of all the untrained preachers who were adding their voices to the general hubbub of independent religion in the period following the initial cessation of hostilities. 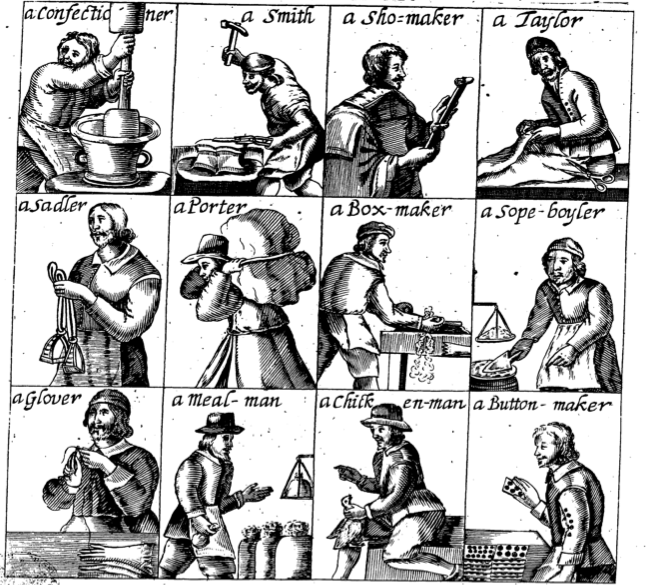 Several trades are represented here, much in the style of the Cries of London, showing some nice details of common people’s dress. Painted by Cornelius Janssens van Ceulen in 1640. I can’t find much about Vincent, but he lived in Kent and died two years after this portrait was painted. He looks straight out of the picture and is neatly turned out in braided doublet and linen. His falling band is well painted, you can almost feel the texture of the linen, edged with what looks like linen cutwork and tied with bandstrings and worked tassels. Spot also the unbuttoned lower portion of his doublet and the lace on his shirt that peeks out. or, THE DRUNKARD, Opened, Dissected, and Anatomised. 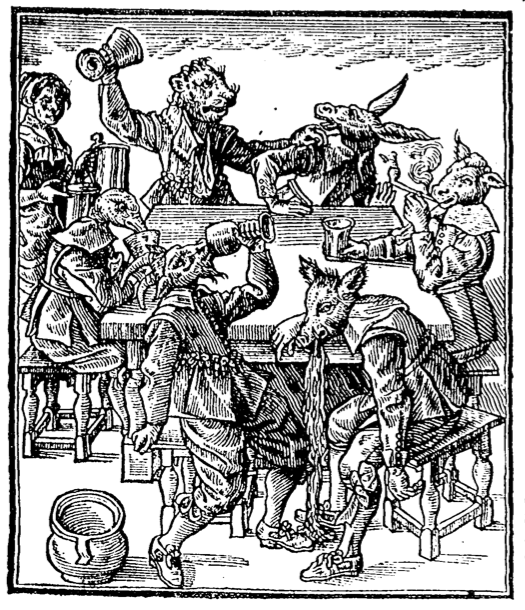 Published by Thomas Heywood in 1635, this anti drinking tract starts with this remarkable image. Six figures with animal heads are on a binge, served by a woman on the left. All the animals are dressed in doublets and breeches, but notice the belt around the duck’s waist, the ribbon decoration on the goat’s doublet (there is a similar one in the V&A costume collection), his shoes that the pig is throwing up on and the lion’s disarrayed collar.